As a staff, Diamondbacks pitchers ranked 21st among 30 teams in WAR (11.0) and 17th in ERA (3.92). D-backs starters came in 22nd in WAR (8.8) and 19th in ERA (4.13). 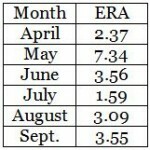 As with most teams, the sample was big enough that there was a pretty close match between ERA and FIP (4.15). If the expected major league starters are healthy next year, the rotation would put up similar statistics in 2014, even though Brandon McCarthy and Trevor Cahill missed significant time and Ian Kennedy’s poor 2013 is forever in the rear view mirror. I’m jumping ahead a bit here, but simply averaging the ERAs of Patrick Corbin, Randall Delgado, Wade Miley, McCarthy and Cahill gives us an ERA of 3.95. For the rotation to improve, we need individual starters to take a step forward — or for one or two starters to get replaced. Pitchers are fungible in a way that position players or not, so it would not be out of place to speculate about possible acquisitions (and as Nick Piecoro has noted, the fact that Kevin Towers has said he doesn’t expect to add a pitcher may not mean much, as he’s said that before but has added someone in each offseason in which he’s been at the helm). Still, this post is about how the roster might break down as currently constituted, so we’ll leave the trade or free agent speculation for a later date. Through the All-Star break, Corbin held a 2.35 ERA; after it, his ERA was 5.19. But the breaking point didn’t come until the very end of August, when Corbin went 5.1 innings in Philadelphia on the 25th, giving up 9 runs (8 earned). If you recall, that was the day after the 18-inning marathon — if the bullpen had not been severely burned out at the point, he probably would have gotten the hook earlier. Corbin had only two decent starts in September (8 IP, 3 ER on the 6th; 6.1 IP, 1 ER on the 11th). I don’t think it’s a leap to expect Corbin to do a little better overall next season, even if few people predicted his early season dominance. 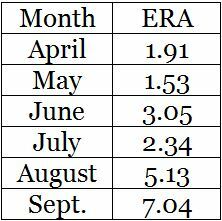 If he matched his April-May in 2014, he’d be a true ace; if he matched his April-late August, he’d be a very, very good pitcher, still one of the top 5-10 in the league. Before that late August start, Corbin had only one game in which he gave up as many as 5 earned runs; we’d be kidding ourselves if we expected him to repeat that next season, but there’s a strong chance he’s better than the overall season statistics would indicate. A big thanks to shoewizard at AZ Snake Pit, who took down rest-of-season rate stat projections from FanGraphs just before the season ended. I’m going to rely on those for most of the D-backs pitchers in this Roster Breakdown series, but I’m hesitant to do with Corbin. ZiPS and Steamer were both very skeptical about the season Corbin was putting up, but they do note recent performance, and on the day shoewizard culled those projections, Corbin had just put up an amazingly horrible month of starts. 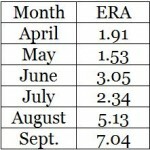 Your guess is as good as mine, but I’m going to go ahead and bank on a 3.20 ERA/FIP for Corbin next season. Not as good as his first half, but not as bad as his season stats. The rest-of-season rate stats collected by shoewizard point to Brandon McCarthy as the next-best starter for Arizona next year, at 4.07 ERA (3.70 FIP). Although McCarthy would lag behind the other starters in K rate, he could lead the way again in walk rate. It’s been an up and down season for McCarthy this year, and not just because of the DL time — the search for a changeup continues. Maybe McCarthy will work on that new splitter-as-changeup in the offseason, and we’ll see a brand new pitcher next year. The point is, McCarthy is not a weak link in the 2014 rotation. The rest-of-season projections actually had Miley as 4th-best, behind Cahill, but the point here is that Miley is a good bet to be an above-average starter, even if he has a rough patch the way he did last May. Something to watch is Miley’s walk rate, which was stellar in 2012 (1.71BB/9IP) but only decent in 2013 (2.93BB/9). Hopefully, the walks don’t continue to climb, but regardless, he doesn’t seem like a strong candidate to be replaced. As for Cahill — if you watched more than one or two of his starts this year, you pretty much understood what was going on. Sometimes, Cahill got away from his sinker, and sometimes that was disastrous; sometimes Cahill had trouble with command in the first inning, or late in his starts (although “late” sometimes meant “fifth inning”). The command issues seemed to be of the light switch variety; either he was on, or he was off. Given the team’s significant financial commitment, Arizona will be committed to giving him a turn every fifth game and hoping for the best (unless another team wanted to pay close to full value for him). Count me in as a Cahill believer. For the team to do well next year, it needs to stay solid across the board but take several chances and have them work out. Cahill is one of those guys. If he rolls and the other starters continue being what they’ve been, the team will have an above-average rotation, or even a very good one. If we didn’t have Cahill, Cahill would be exactly the type of pitcher that Kevin Towers would be on the lookout for to bolster the rotation. That brings us to Delgado. Towers is on record as thinking Delgado could still improve, and there’s definitely reason to think he could. Delgado’s HR per fly ball rate was ridiculously high this year: 17.3% HR/FB, good for 5th-worst among 145 SPs this season with at least 100 innings pitched. Perhaps related is Delgado’s big dip in walks — he posted a very good 1.78 BB/9 with the major league club this year, significantly lower than his rate with Reno this year (4.92), with Atlanta last year (4.08), and with Gwinnett last year (4.26). Kudos to Delgado for lowering the walk rate like that, but when you see that his career HR/FB with the Braves is 10.7% (127 innings)… could it be that by hitting the strike zone more consistently, Delgado got squared up more often. It would be unfair to expect a lower HR/FB ratio (even if those tend to even out over time) if we also expect a repeat of that sterling walk rate. Pencil Delgado in at the back of the rotation, but given his age next season (24), now is probably the time to see what he can prove in the majors. It’s too early to give up on Delgado, and he can’t prove what he can do in a major league rotation without actually being in a major league rotation. Fortunately for Arizona, the five guys discussed above are not the only starting pitchers likely to be options next year. I see no reason to discuss the Chase Andersons and Charles Brewers of the organization; suffice it to say the club has depth in the minors that could pitch in if necessary. Zeke Spruill and David Holmberg are in a different category, as they both started at least one game for the big league club this season. Archie Bradley and Tyler Skaggs present their own types of situations, too. Let’s start briefly with Daniel Hudson, who required a second Tommy John surgery this season while rehabbing from his first. We’re not too far removed from Hudson’s 2011 season, which comes close to Corbin’s 2013, in terms of overall numbers — but it’s hard to know what to expect for his return. Hudson had his latest Tommy John on June 18, putting him on track for June or July in 2014, but the organization may want to take things a little slower this time, just to be safe (as far as I know, only Jason Isringhausen has contributed at the major league level after a third TJ surgery). He’s also not a great fit for this post because when he does return, it’s most likely to be in relief. What happens in 2015 is anybody’s guess. Zeke Spruill is also probably a relief guy, although I’m going to defer to Jeff in talking about most D-backs minor leaguers. From what I understand (and what Kevin Towers has said), Spruill has a good shot to be a back end starter — but this team has no true #5 starter in the rotation, so a back end starter really can’t be an upgrade. He also wouldn’t fetch much in a trade, so depending on how the bullpen mix works out, I’d like to see Arizona try him there next season to see what they have. He did get four games in relief next year, but for his sake, I think we can all wait to draw conclusions until we have a bigger sample. David Holmberg is a different story. I’m not sure yet where he’s going to rank on the Inside the ‘Zona prospect rankings, in part because where he ranks (for anyone) depends completely on what criteria you favor. Jeff and I talked about Holmberg recently — in his lone start for Arizona this year, Holmberg was constantly just outside the strike zone. It didn’t seem like he had control or command problems. In fact, I’d say quite the opposite — he was just off the strike zone so consistently that it seemed like he had great command, but poor control (if that were possible). Jeff has hypothesized that those may have been strikes for AA umpires, and that would explain everything. That sets up two concerns for Holmberg, however. If forced to adjust to a major league strike zone, will his minor league numbers translate more poorly to the majors than those of the average SP prospect? Possible. My other concern is that since he’s a command but not a “stuff” guy, there’s little reason to think his pitching would play up in a relief role. His SP rate stats would mostly likely be very similar to his RP rate stats, so if he’s not going to cut it as a starter, he’s not very useful (although it would be worth something to free up Josh Collmenter for high-leverage long man duties, as opposed to mop up duties). For our purposes, Holmberg is not a guy we want to slot into the 2014 rotation, even partway through the year. Let’s see if he gets shelled with Reno. Tyler Skaggs and Archie Bradley are the guys who might step into the ML rotation next year even if the other starters stay healthy and the season goes according to plan. If I told you that by waiting until late April to bring up Bradley, the D-backs would control him through 2020, instead of only through 2019… wouldn’t you almost be disappointed if he broke camp with the team? I think late April is likely, anyway, because the team has a good excuse to wait: they might insist on seeing Bradley show decent control with Reno before bringing him up to the bigs. It was partly because of a big step forward with control at Visalia (10 BB in 28.2 innings) that Bradley shot up prospect lists last year. Bradley continued to exhibit improved control in AA in May (16 BB in 34 IP) and June (13 BB in 32.2 IP), but then the wheels started to come off in July (14 BB in 20.1 IP). As Jeff pointed out a month ago, Bradley’s had some real doozies — in 5 of his 21 starts with Mobile, Bradley walked 5 or more batters. Given the service time benefit to keeping him in the minors, Bradley will probably have to show not just in spring training but in April that he can hit the strike zone consistently — if he doesn’t, his debut will probably get pushed back even more. Tyler Skaggs is a totally different matter. I’ve written here a few times about Skaggs’s drop in velocity, and Nick Piecoro has noted that the same thing happened to Skaggs in 2012. It’s all about spring training for Skaggs. If we see the velo there, it probably means the mechanics were successfully adjusted in the offseason — and we might get a full-on competition between Skaggs and Delgado for the last slot in the rotation. If a starter went down in the spring, it would probably be Skaggs who took the spot. But if Skaggs struggles in the spring, I have no idea what the organization will do (it may be that Reno is not the best place for him to find himself, if he hasn’t done so by late March). Could be Mobile, could be Arizona, could even be Arizona in the bullpen (where even the late-season version of Skaggs would be an asset). Barring injury, I do think the April rotation will be Corbin, Miley, McCarthy, Cahill and Delgado. “Good Skaggs” would be next in line to open the year, and unless Bradley shows excellent control in spring training, it would probably be Holmberg next on the depth chart. Something will probably happen to that group, though, opening up a spot for Bradley. Holmberg may be the pitcher with the most frequent flyer miles this season. Lots of mysteries in the rotation. Will Corbin be early-2013 Corbin? Will McCarthy lock down that splitter as an effective changeup? Will Cahill be able to keep the switch on with his sinker, and can Delgado hold onto some of the walk rate improvement while lowering the HR rate? Will Bradley show that control? For me, of all the question marks, it’s the Skaggs one that feels most important. Either we have a possible #2 starter there, or we don’t have much at all. He’s either good enough to push Delgado out of the rotation, or he’s not. If the D Backs are going to try to compete for the division title in 2014, and not just try to squeek into the WC game, then they need a true front of the rotation ACE, so that an outlier performance like Corbin’s in 2013 or Miley’s in 2012 has a chance to support that ACE and make this a truly formidable rotation. Even if Bradley fulfills all our hopes and dreams by cutting his walk rate in half, he is at least two seasons away from completing a 200 inning season in the majors. So they should shelve the talk about going after a Left Handed power bat, look for offense from within, and use whatever bullets they are inclined to fire to try to get a front of the rotation guy. Thats probably not realistic either, but if they are going to improve any one spot on the team to make the biggest impact on their chances for a division title, it’s the rotation. They aren’t going to take down the Dodgers without an ace as long as Kershaw and Greinke are healthy. The rotatation can be altered for success quickly. Make Wade the no.1 guy and Corbin the 2. Thats a great spot for Corbin to develop at and Miley showed the stuff last season. Cahill could get the go at 3 and i say we one of the top ten rotations in the the NL. Delgado and Skaggs shoyld make that rotation easy. McCarthy needs to be out of the league quick.